This TI-30X IIS was manufactured by Nam Tai Electronics, Inc. for the Wal-Mart sales chain. It was released for the Back-to-School 2003 campaign together with a lime-green TI-30X IIB. In 2004 Texas Instruments introduced a new design line with a really prominent name plate and some modern applications like an aluminium bezel around the display. As a result of these changes we received from Wal-Mart in 2004 this nice TI-30X IIS and in 2005 even an orange TI-30X IIS. 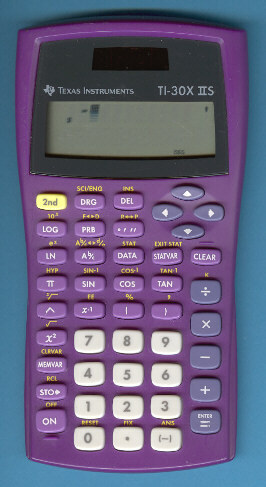 Main competitor Target introduced the first custiomized TI-30X IIS in 2006 and office product retailer Office Depot followed in 2007 with a colorful TI-30X IIS. © Joerg Woerner, December 19, 2006. No reprints without written permission.